According to data from U.S. Census Bureau, poverty in the U.S. is more common today than it was 10 years ago. That national trend is also reflected in most major cities. In places like New York, San Francisco and Chicago, both the number of people in poverty and the overall poverty rate have increased since 2005. There are some cities, however, that have bucked this national trend. In fact, SmartAsset’s analysis of Census Bureau data found that not only has poverty fallen in a handful of U.S. cities, it has plummeted. Poverty is rising in largest cities. 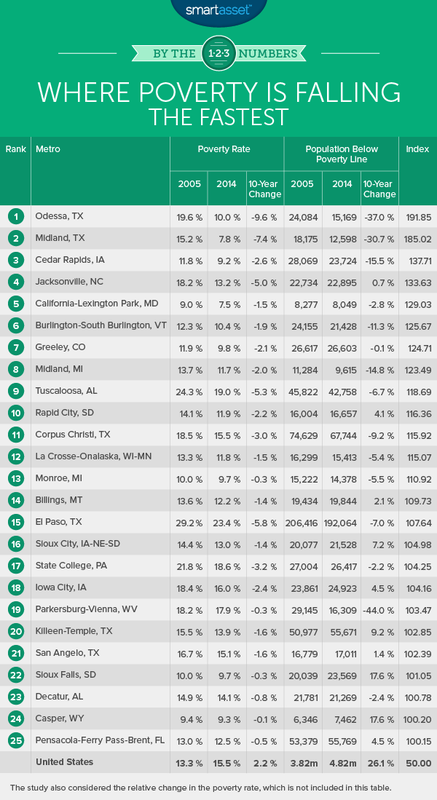 Over the past 10 years, just one of the 100 largest metro areas in the U.S. saw declines in both the number and the percentage of people living in poverty. On the other hand, 25 smaller metro areas saw such across-the-board poverty declines. Texas metros top the list. The top two metros where poverty is falling the fastest are both located in Texas. Of the 26 metros where the poverty rate and population in poverty have both declined, six are in Texas. But not California. Zero of California’s 26 metro areas have seen declines in the poverty rate over the past decade. Increases in poverty may also be exacerbated by the rising cost of housing and other living expenses in places like San Francisco and Los Angeles. The Odessa economy has flourished over the past 10 years, driven by strong growth in the region’s energy sector. During that time, the Odessa metropolitan area’s population has grown from 133,000 to 153,000, an expansion of about 15%. The population living below the poverty line, however, has fallen by nearly 40% over that same period. It has gone from 24,000 to 15,000. In short, poverty in the Odessa area has plummeted. Whereas the metro’s poverty rate was well above the national average in 2005 at 19.6%, today it is just 10%. That is far below the national average. 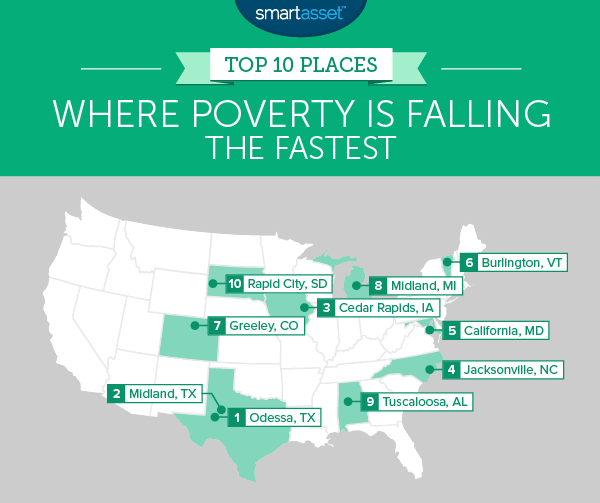 Located 20 miles east of Odessa, Midland today has the third lowest poverty rate of any U.S. metro, at just 7.8%. It has not always been that low. In fact, in 2005 the poverty rate in Midland was 15.2%, higher than the national average. The area’s booming economy and an influx of new residents have all helped drastically reduce poverty in the region over the past 10 years. The second largest city in Iowa, Cedar Rapids has a metro area population of more than 263,000. That is an increase of 9% since 2005. Jacksonville is located 20 miles from the Atlantic coast in eastern North Carolina, and is home to Camp Lejeune, a 246-square-mile military base. It is also one of the fastest-growing metro areas in the country, with total population increases of nearly 50% since 2005. Moving to NC? 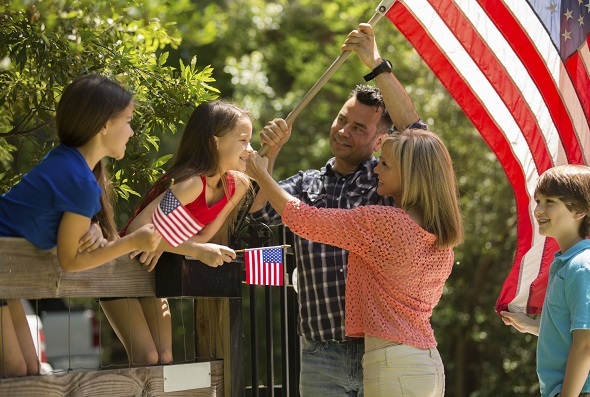 Find out what your taxes will be with our North Carolina tax calculator. Despite that population explosion, housing in the area remains comparatively affordable, with a median home value of just $156,800. For those living at or below the poverty line, that could make a big difference. The poverty rate in the Jacksonville metro has fallen from 18.2% to 13.2% since 2005. The California-Lexington Park metro area, which is coterminous with St. Mary’s County, Maryland, is located along the Chesapeake Bay south of Washington, D.C and Baltimore. After falling from 9% to 7.5% over the past decade, the poverty rate in the California-Lexington Park metro is now the lowest of any U.S. metro area. Situated along the eastern shore of Lake Champlain in northern Vermont, the Burlington area is the largest metro area in the state. The city of Burlington is home to the University of Vermont, which is one of the largest employers in the area. Even as the total population in the Burlington metro grew by more than 18,000 over the past decade, the number of people living below the poverty line fell by 3,000. The city of Greeley was originally founded in 1869 with the hopes of becoming a utopian settlement, built upon ideals such as temperance and a commitment to family. Since those early days, alcohol in the city has been legalized and the population has boomed, growing by 24% in the last decade alone. Nonetheless, poverty in the area is low. The Greeley metropolitan area’s poverty rate ranks as the 20th lowest among the more than 370 metros in SmartAsset’s study at 9.8%. That represents an absolute decline of 2.1% since 2005. The number of people living below the poverty line in this central Michigan city fell by nearly 15% over the past decade. Today there are less than 10,000 people in poverty in the Midland metro area. That equates to a poverty rate of just 11.7%. This is well below the national rate, which is 16.3%. Tuscaloosa is home to the University of Alabama which, with a student body of over 37,000, is a key driver of the region’s economy. The manufacturing industry is also important, as the area is home to a Mercedes Benz assembly plant and factories for a number of other major employers. The metro area’s population grew from 189,000 in 2005 to about 236,000 today. Nonetheless, the number of people living below the poverty line in the Tuscaloosa area has fallen over the past decade by more than 3,000. As of August 2015, the unemployment rate in the Rapid City metro area was just 3.6%, well below the national average. That is in keeping with the long term trend. According to the Bureau of Labor Statistics, unemployment in Rapid City has not been higher than 5.4% at any point during the past decade, even during the recession. That means there are more people with jobs and fewer who are struggling to stay afloat. The poverty rate in Rapid City has fallen by 2.2% over the past decade and today is just 11.9%, well below the national average. Using U.S. Census Bureau data from 2005 and 2014, SmartAsset calculated each of these four metrics for the largest 376 metro areas in the United States. We then determined how far above or below the national mean each metro area rated for each metric. We totaled those deviations and ranked each metro accordingly. An index score of 100 reflects a metro that is one standard deviation above the mean for each metric.